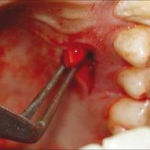 Basically, it is a form of contiguous grafting (pedicle graft} which utilizes as the donor site only the connective tissue of the palate adjacent to the ridge. The epithelium over the pedicle is first removed. This is readily done, using a non-epinephrine bearing anesthetic, by sharp dissection or by use of a rotary diamond instrument. Free bleeding, permitted by the non-epinephrine anesthetic, is evidence of complete epithelial removal. 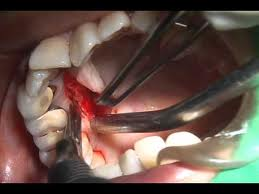 The tissue is then infiltrated with an anesthetic containing a hemostatic agent, and a connective tissue pedicle flap is outlined through to the osseous, and then elevated from the palate within the de-epithelialized zone. In this procedure, it is important that the proximal marginal tissue of the adjacent abutment teeth is not involved. This will ensure stability of the crown margin to tissue relationship. A zone of tissue is de-epithelialized corresponding to the amount of augmentation required, and the pedicle may even be rolled in upon itself twice before being placed on the apex of the residual osseous ridge. Next, a pouch on the labial aspect of the ridge is created by blunt dissection and the flap is inverted upon itself and placed into it. A specific suturing technique is used to maintain stability of the pedicle graft. The needle is initially inserted from the buccal surface through the rolled pedicle to the palatal side and then back through the pedicle and the pouch, through to the buccal surface once again, where the suture is tied off The donor site from which the flap was rolled will initially heal as an epithelial-covered depression, which will slowly granulate in and fill. The pontic is reduced, and the area is dressed and allowed to heal for 10 days, when the sutures are removed. The area is then redressed for 1 week, when a plasty is done to prepare a concave pontic recipient site for an ovate pontic. There are occasions when an ovate pontic can be placed at the time of the initial surgery and the tissue allowed to heal and form around it. Such situations usually require less gingivoplasty at a later date. This type of procedure is excellent if the loss of dimension is predominantly vertical. 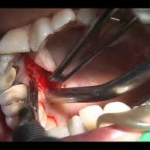 It also allows the mucogingival junction to be repositioned by the extension of two vertical incisions out to the buccal surface of the involved area. The procedure should not be used when there is inadequate thickness of palatal tissue available or when the edentulous ridge area is knifelike, with scant underlying bone and soft tissue. 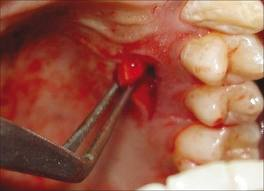 That is, there must be a scaffold of underlying bone to support the graft; otherwise, excessive shrinkage could result. These situations can be assessed utilizing needle probing under anesthesia prior to surgery. This procedure is most useful in knife like edentulous ridge areas or when there is insufficient palatal tissue available in the ridge area for use of the roll technique. It is also particularly useful when a large amount of gingiva must be added in a vertical dimension. This technique, in contrast to that using the pedicle graft, described above, requires the utilization of a donor site distant from the ridge to be augmented. An excellent site, which invariably yields the required adequate thickness of donor tissue, is the tuberosity area distal to the maxillary molars. The recipient site is prepared first by a partial thickness dissection which removes the epithelium and a nominal portion of the underlying connective tissue, resulting in a free bleeding surface. 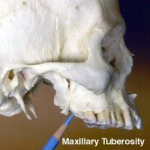 The amount of required tissue is then outlined on the tuberosity area according to the measurements taken from the recipient site, and a large wedge of both epithelium and connective tissue is removed. This wedge, the undersurface of which is shaped to conform to the ridge to be augmented, is sutured in position. It is essential to expedite this stage of the procedure, allowing for rapid coaptation of the free graft and the development of adequate nutrient circulation. Sutures are removed at 12 days. At this stage, the resulting tissue may not blend in perfectly with the tissues above and lateral to it. A gingivectomy or gingivoplasty invariably is required to blend in the donor tissue and to develop the concave form of the pontic recipient site. It should be emphasized that these plasty procedures should not be done at the time of surgery but only at a subsequent visit, following the “take” of the graft. Loss of Dimension of a Horizontal Nature – The subepithelial connective tissue graft generally isused to augment ridges with a predominantly horizontal deformity. Depending upon the anatomy of the deformity, two types of surgical plastic procedures are available to the clinician: the flap or the pouch (single or double). The basis of all these procedures is the placement of a graft of only connective tissue from a remote site, subepithelially, in the area of the ridge requiring augmentation.